ESCAMBIA COUNTY, FLA. - Less than 24 hours ago, Hurricane Micheal devastated the residents in the Florida Panhandle with its heavy winds, rainfall and storm surge. Gulf Power crews worked quickly through the night to restore power to their customers. Linemen crews were dispatched from numerous of cities all over the U. S. to help those impacted by Hurricane Michael. According to Jeff Rogers, Gulf Power spokesperson; “This was an unprecedented storm, and our customers will see an unprecedented response from Gulf Power. Gulf Power told Channel 3 said they dealt with issues like trees and heavy debris blocking roads, and communications down can slow down the rebuilding and restoration process, but Gulf Power said they are prepared for this type of storm devastation. According to Gulf Power, Hurricane Micheal caused so much damage to Panama City's electrical grid that crews not only had repair the lines, they had to rebuild the electrical system. 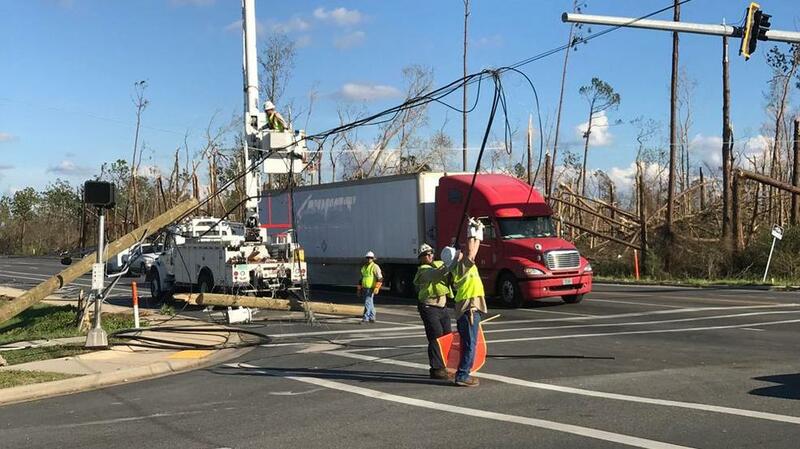 Gulf Power officials say, "Less than 24 hours after the storm, more than 3,000 storm personnel from around the country arrived in the Panama City area Thursday to begin the restoration and rebuilding process. So far, more than 4,000 customers have been restored on Panama City Beach. Power has been restored to all customers in Escambia, Santa Rosa and Okaloosa counties, and it’s expected that customers in Walton County will be restored tonight. But customers in the hardest hit areas should prepare to be without power for weeks. Initial evaluations by Gulf Power indicate widespread, heavy damage to the electrical system in the Panama City area." According to Gulf Power, crews have restored power to more than 32,000 Gulf Power customers in the wake of Hurricane Michael, but the work is just beginning for power restoration in the Panama City area.